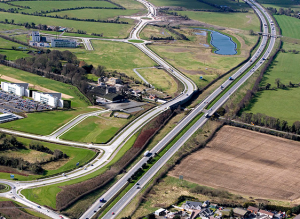 Commuters and residents will be delighted to read that the works on the M7 widening project and Sallins bypass are making progress. Below are updates on the various projects underway associated with the construction work. Credit must go to Kildare County Council and SIAC for their work on this site and the update that they have provided. Section from Budget 2018 detailing the funding for the Sallins bypass and Interchange. 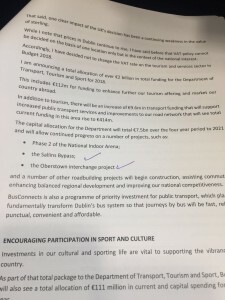 delighted to see that Minister Donohoe has taken on my submission to the Capital Infrastructure programme and provided funding in the Budget for the Sallins bypass and the Osberstown interchange. 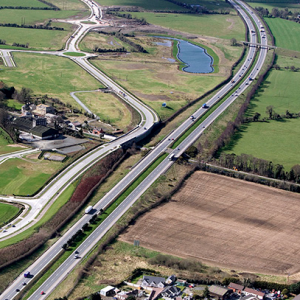 This funding commitment is announced weeks after the contract was awarded to widen the M7 motorway, deliver the Sallins bypass and the Osberstown Interchange. I have been working and campaigning for this project to progress since moving to Sallins, as both a councillor on Kildare County Council and as a TD in Dáil Éireann. I will continue to put pressure on the Government to see these vital pieces of infrastructure delivered for Sallins, Naas, and the wider area. I am delighted to confirm that the contract has been awarded for these vital pieces of infrastructure. Since becoming active in politics and as a local resident in Sallins I have been campaigning for the M7 widening and the Sallins bypass projects to be completed. It is a long time coming but is very welcome. 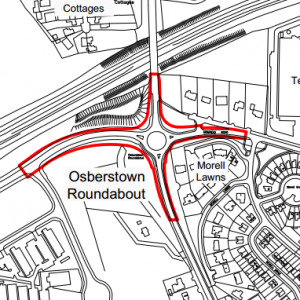 Once completed these works will be critical for road users in Sallins, Naas plus the wider areas such as Prosperous and Clane. The Sallins bypass in particular will take traffic out of Sallins and help ease congestion in the village and surrounding areas which is critical in helping people get to work on time. I want to credit Peter Carey and his team in Kildare County Council for their work in progressing this project.